With Republicans, racism isn't a bug, it's a feature. They'd take pointing it out as a compliment. If the message received is merely, "You are in the party of racist pigs and we both know it," I'm okay with that, too. Sure, but that's like telling Melissa McCarthy that she's fat. She is - but she makes a good living off it, has incentive to stay fat, and has no reason to change. Since the start of the Mike & Molly series, McCarthy has lost an estimated 75 lb (35 kg). I really noticed when "Sean Spicer" was Sean Spicer size rather than Melissa McCarthy size. I stand partially corrected. 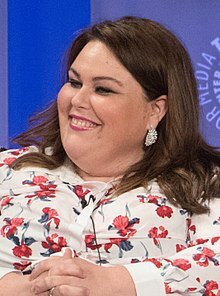 Actually the fat actress I was thinking about was Chrissy Metz, who is apparently losing or at least temporarily misplacing some weight on the show but is still basically paid to be fat. We have found the cure for racism - an NFL salary and community property law. White male privilege: When America elects an unprecedented number of women and minorities, close the government and blame Latinos. Not signed. I'm fine with King representing Repugs in Congress and Repug voters. The term probably originated as a name for British subjects who chose to stay in India way back when and maybe also to French citizens who chose to stay in Vietnam after 1954. The term implies that the person no longer has any patriotic duty or identity with his home country, particularly when those Brits or French married an indigenous person. Most immigrants and refugees don't do so. Immigrants or refugees may or may not still have an affinity or identity with their home country. Also, the expat term originally applied to professionals, writers, and artists (not the average person on the street). I think it's a leap to consider the word a racist term. Kentucky inbreeding is a dangerous thing. When you add to that the fact that Catholics supposedly don't believe in birth control, and there you have it. Parents, 97% white Park Hills, KY, school, Catholic church, teachers, chaperones, peers and lifelong racist POTUS all contributed. No surprise that this happens when they are at a misogynist march. Bigotry breeds more bigotry. I'm not sure I have enough experience with the usage to have an opinion. The article makes the claim that non-white Americans with similar professional situation and status don't get called ex-pats. The term most certainly doesn't apply to "just white people." It is typically used for a person who chooses to live in another country with no intent to live there permanently or to seek citizenship. An immigrant is any person coming to a country with the (general) intent to live there permanently. An emmigrant is a person leaving a country with no particular intent to return. It may very well be that more white people than not have jobs that take them to other countries, or snowbird in another country or live for a couple of years in another country for school, adventure, whatever, but it is not a racist term. I think the author is talking about how it's used irl, not how it's defined. As far as I know, the Cuban community in Miami is commonly referred to as expats. Last edited by neoplacebo on Sat Jan 19, 2019 5:27 pm, edited 1 time in total. I think the archdiocese for Kentucky is Louisville. Be interested to see if they step up. Agreed, but it's usage still doesn't make a racial distinction except as may result just from there being more white people in the group. If you look for something like "best countries to retire in" for example, you'll get comments like, "Spain is an expats paradise" or "there's a large expat community in Cabo San Lucas" etc.